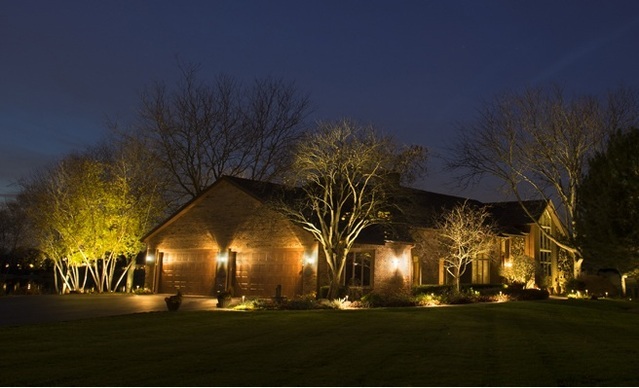 Professional landscape lighting is a great way to provide visibility to your yard at night while still keeping the natural beauty of the landscaping. ​Outdoor lighting really has a "WOW" factor. Nothing puts forth the image of great property like accent lights for your home and landscaping. They really allow you to see outside at night while drawing attention to flowers, trees and decorative areas of your home. They are also used to keep stairs and pathways well lit so their is less chance of someone falling. The purpose of outdoor lighting can range greatly from person to person. We can meet any outdoor lighting need, whether it is to accent your landscaping at night, to enhance visibility in dark areas of your home or to provide a festive look for either a party or the holidays. Call us today so we can assist you with making your yard beautiful. All of GreenSeasons' landscape light installations are first carefully planned out by a licensed electrician. This is to ensure both the functionality and safety of the outdoor lighting system. An improperly designed light system can lead to electrical shorts, premature burnouts of lights, or electrocution. We take the design, installation and repair of outdoor light systems very serious to ensure the complete satisfaction of our clients. GreenSeasons only uses high grade lighting products. We feel using these products will retain the look and value of the first night you use them for years to come. These products are built to last and come with a standard three year parts warranty or up to a 10 year warranty.